So you've deployed a tabular model. How can you write DAX queries to get information out of it within SSMS (SQL Server Management Studio)? I've already mentioned this in my previous blog on how to write DAX queries, but thought it would be useful to explain this in more detail here. Choose to connect to Analysis Services. 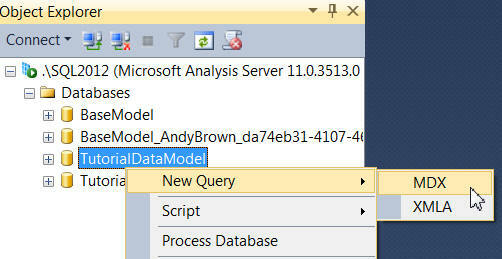 Choose this option (even though you actually want to create a query in DAX, not MDX). Here I'm summarising total sales by species. Note that you can't drag columns in from the cube on the left, since SSMS will assume that you're writing MDX and use MDX format, not DAX, to type in the column names. Click on the usual button to run your query. 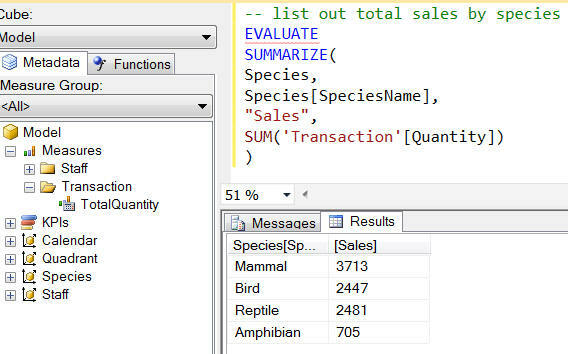 Next up - including DAX queries within SSRS reports.